1893: the cusp of the 20th century. A time of industry, beauty, mystery, and madness. The World’s Columbian Exposition (better known as the Chicago’s World’s Fair) was meant to mark America’s rise into the industrious and intellectual heights dominated for centuries by Western Europe. It was to be America’s crowning glory. What was born in those magical, innocent final days of the 19th century was a blood thirsty madness that would change the American psyche forever. 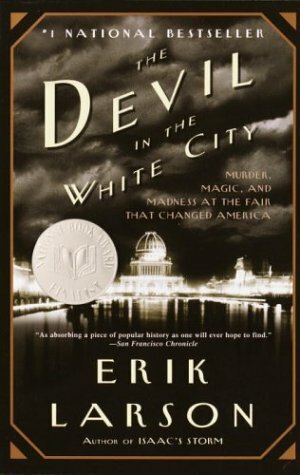 Eric Larson’s historical narrative The Devil in the White City moves the reader through the ambitions, triumphs, and downfalls of the creators and designers of the World’s Fair, the magicians of an industrialized world, set to change the future but still dwarfed by their own nearsightedness. Living alongside these visionaries is a monster that uses the World’s Fair as his hunting grounds to prey on the naïve populace of young women pouring into Chicago that would make him America’s first serial killer. A twisted tale of intrigue and horror, The Devil in the White City is sure to be a thrilling tale of the heights of human ingenuity and the depths of inhuman savagery. ~Review written by Melissa Frye.